To fabricate and measure solid state implementations of manufacturable atomically precise devices. Build the infrastructure to fabricate prototype few-atom structures in isotopically pure Si and characterize them using new, unique metrology capabilities. Our goal is to fabricate few-atom devices that display transistor operation or that can operate as coherent qubits, and to provide the metrology and understanding needed by US industry. Figure 1. STM patterning at 4K. To realize atomically precise devices we have vertically integrated a program from design and fabrication through electrical characterization, device operation and state-of-the-art atomistic modeling. The key enabling fabrication technology is hydrogen-based scanning probe lithography that allows deterministic placement of individual dopant atoms in the Si lattice. We pattern Si at the atomic scale and are implementing atomically aligned mask and etch processes, providing a method for fabricating atomically precise 3-D structures. We are implementing the fabrication infrastructure necessary to manufacture prototypical few-atom devices in a controlled solid-state environment and building the measurement framework necessary to fully characterize these devices. We are developing the fundamental theories and models needed to understand these devices at the atomic scale and the basic relationship between the atomic arrangement and final device performance. Integrated atomic dopant deposition with safety protocols (phosphine) on NIST atomic fabrication system, and demonstrated atomic dopant placement. Demonstrated enriched Si substrates with sufficient defect-free quality, identified low temp conditions using in-situ STM to isolate optimum overgrowth conditions. Extended atomistic modeling tools to model Si-based structures including individual dopant atoms. Integrated atomic dopant placement with patterning, oxide etch, and overgrowth. Integrated conventional structures with nm resolution H-patterning and two-dimensional doping to form electrical contacts and side-gated regions forming ultra-small devices with sub-5 nm features. New Phosphorus doping capability installed and made operational. Two new Si overgrowth capabilities installed - ebeam evaporation and SUSI evaporation. Major upgrades to both UHV systems to enable vacuum transfers. Pumping systems upgraded to target 1x10-11 torr base pressures throughout multi-chamber facilities. A UHV vacuum transfer suitcase is now operational. Both SDMD systems and the QMD system are connected via UHV transfer. Enable fabrication methods capable of routine atomic precision using an STM. Applying these fabrication methods to enable new quantum device research that lays the foundation for future generations of memory, logic, and devices that rely on the quantum nature of the structure. Demonstrate a functional atomically precise device for classical information processing. An atomically precise implementation of the tunneling field effect transistor (TFET) has the potential to create classical computers with significantly reduced power consumption. Heavily-doped, abrupt pn junctions are the building block of TFETs. Demonstrate a tunable double quantum dot structure to enable atomically precise devices for quantum information processing and metrology. We will combine our STM atomic fabrication, quantum materials, atomistic modeling, and electrical measurement techniques to correlate energy levels, tunnel coupling, and exchange splitting with atomic positions, and demonstrate control of tunnel coupling and energy levels with gate voltage to establish atomically precise devices for quantum information processing and metrology. Use STM and modeling to measure the position of individual dopant atoms following activation but prior to any overgrowth and device encapsulation, to within one lattice constant. Use a combination of modeling and in situ STM spectroscopy to measure a single or few dopant atom quantum dot before device encapsulation, relative to a source and drain, to within two lattice constants in all three spatial dimensions. Use a combination of surface or side gates to control the tunnel coupling of the atomically precise quantum dots and the exchange splitting. Figure 2. 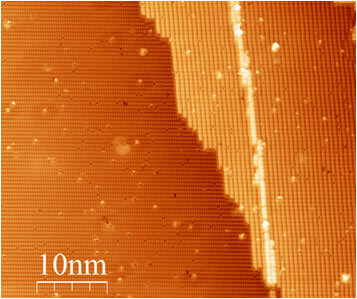 A STM image shows two Si(100) terraces and a single atomic step(height of 0.136nm) between them. A STM patterned a single line on the right side of terrace. System1: UHV STM with surface analysis, Phosphorus doping, and Si overgrowth (ebeam and SUSI). System 2: UHV STM with Si overgrowth (SUSI), Auger, and oxidation. STM designed for positioning. System 3: A new low-temperature UHV STM facility with low temperature imaging and spectroscopy. This system is targeted at in-situ atomically precise fabrication and measurement. NIST Nanofab, Extensive collaborations with Quantum Measurement Division. Figure 3. 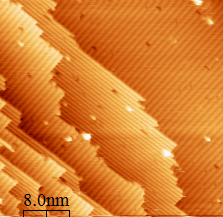 H-terminated Si surface.